The significance of feathers as a personal symbol dawned on me in my early thirties. My thirteen-year-old son, Tommy, had died, a victim of being in the wrong place at the wrong time in a heavily armed city. My younger two children were confused and scared; my husband was inconsolable; by default I became the glue that held us together. And sometimes I had to get out of the house to walk off the tension required of good adhesive. From time to time on these walks I’d notice and pick up a feather – usually crow or pigeon or sometimes robin or sparrow – absent-mindedly stroking the soft barbs as I carried the feather home. One day I was surprised to correlate these finds with the times I felt especially bereft or angry or perplexed about what the hell was the purpose of life in general and of my life in particular. Gradually I realized that in these lowest moments, almost without fail I’d find a feather on my path. And always I’d collect it as mine. You see, I believe that prayer at its best is not asking (or begging or bargaining) for a divine favor or intervention. Rather, prayer is a deep silence, a holy listening, sacred attention-paying. And, I believe, this is a two-way effort; God, too, listens and pays attention and is silent. Nothing more is needed, but that the Holy One and I take the time to notice each other and to be fully present to each other. 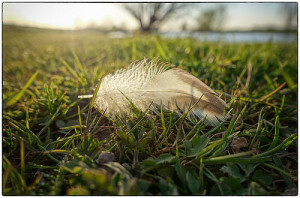 And after my dark moments of feeling anguished before God, whenever I’d find a feather I took that as a sign of reciprocation, of Divinity having seen me, having felt with me and heard me – just as I am – and having blessed and affirmed me by seeing that a prayer feather was dropped in my path. When I began working with marginalized people in hospitals and nursing homes and hospices and the streets, I needed these mutual prayer times with God more than ever. And even in such unlikely places as the bedroom of a dying woman (where a feather had worked its way out of her pillow) or the hiding place of a homeless man (where a pigeon had pulled a feather loose beside a freeway pillar), there was the symbol of God’s prayer with me. Throughout my home there are feathers – everything from tiny hummingbird feathers taped in my journal to the polka-dotted feathers of guinea hens, to a feather from Augustus, the goose who saved my life (a story for a future blog, perhaps), to a vase of outrageous peacock feathers from a friend’s pompous flock. All these feathers are beautiful and complex and fascinating. And now you know that they are also sacred, because they were dropped ahead of me somewhere on my path. I’m searching now for a graphic artist who can design for me a personal logo that includes a simple feather and some sense of what it means to me. If I’m successful in finding one, I’ll post the new logo in a future blog. In the meantime . . . when you most need reassurance . . . may you find a feather on your path. As usual, your words tear me down and lift me up. I’m broken by the pain you evoke and rebuilt some, by hope. I’m reminded of your story about Gloria. The part where she says; “it’s reciprocal”. Prayers heard, prayers whispered. Captured in the delicate and formidable feather. Thank you. Thank you! I needed to hear, most especially today, that “prayer is a deep silence, a holy listening, sacred attention-paying”. Your reflections have reminded me that I MUST make and take quiet time for listening prayer. Big Hugs and lots of Love!!!!!! This was such an insightful piece to read. The feather symbolizes such beauty! In the Native American culture feathers symbolize the connection to our creator and that all things in this universe are connected. The tribes would often gift warriors a feather for being brave in a battle. The symbolism of a feather is deep. Wonderful piece Cynthia!! You bring so many thoughts to mind. As always, we appreciate you. Thank you, Cynthia. This beautiful missive came through on the 2nd anniversary of my son’s death. Perfect reflection for me. Once again, Cynthia, your writing is exquisite, and captured me from the first sentence. I know you have had many tragic experiences in your life, as we were childhood friends, and I remember. You simply have a way of capturing the reader with your writing. Thank you for allowing me to see into your soul with your expertise at imagery. Miles and years apart sweet friend and even now words keep you ever in my heart. Beautifully written, amazingly true….thank you dear Cynthia. Whenever I have found a feather in my path I have always known it was a gift. My house has many feathers and I can remember where and when I found them each of them. They are special gifts and they told me I was on the right path and everything was as it should be. I have been informed that it’s illegal to keep feathers. I’m sorry, but if a bird has given it to me, it’s a gift and I treasure it. Thank you, Cynthia, for being observant, for watching so carefully, and for sharing what you’ve seen. Such a profound understanding of prayer! Thank you. I am reminded of a saying about “a feather on the breath of God”. I forget the context. Perhaps you know. Beautifully eloquent, heart-filled and profound, Dearest Cynthia! You have captured my experience of prayer as well.